JOED VIERA/STAFF PHOTOGRAPHER-Lockport, NY- Amy Hanssen-Keyes and her husband David Keyes pick up a $10,000 check from Tops. 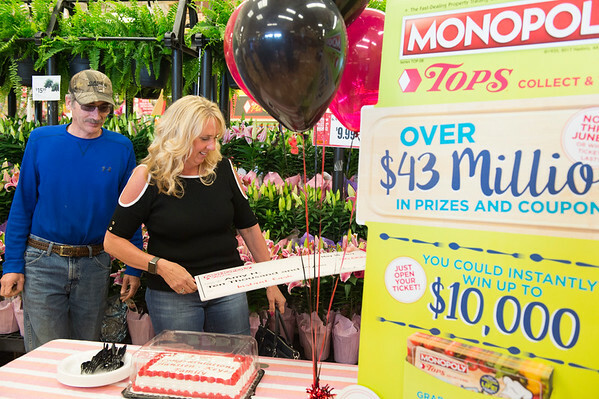 The couple won the prize after a recent visit to the store as an instant prize from the supermarket chain's Monopoly game. Hanssen-Keyes says that they play Monopoly every year but this is the first time they've won. The couple's son Clayton usually collects the all the pieces for the family. Although the store has had other winners, $10,000 is the largest cash prize the Transit Road store has ever rewarded. Tops' collect and win game continues through June 17th.